The question of restoring women to the ordained diaconate surfaced during the Second Vatican Council and continued to resound in academic and pastoral circles well after the diaconate was restored as a permanent order in the church in the West. This volume contains twelve essays-five translated from Italian, three translated from French, and four in their original English-that answer the questions about the history and possible future of women deacons. Phyllis Zagano is senior research associate-in-residence and adjunct professor of religion at Hofstra University and founding co-chair of the Roman Catholic Studies Group of the American Academy of Religion. The author or editor of eighteen books in religious studies, including Catholic Press Association and College Theology Society book award winners, Zagano is also the series editor of the Spirituality in History Series published by Liturgical Press. "Timely and essential reading for anyone interested in the topic and the commission's work." "Dr. Zagano offers a deep understanding of the lost roles of women deacons in the church, supporting the importance of reestablishing the role for women." "This book demonstrates that there are substantial grounds for further conversation within the Roman Catholic Church. And in that further work how good it would be to bring into the discussion the experience of men in the permanent diaconate in the Roman Catholic Church and of women in other Communions. An important resource for any future process of discernment." "Wherever you are on the spectrum of support or distaste for the ministry of women deacons, this book will intrigue you. Zagano's answers are clear. You can't help but be informed, if not overwhelmed, by the research and knowledge that Zagano has made available." "A major and essential contribution to the debate on the issue of women in ministry." "A valuable resource for both the history and the ongoing conversation around ordination of Catholic women to the diaconate." "The publication of this could not be more timely or relevant, given Pope Francis' institution of the `Study Commission on the Women's Diaconate' of which Phyllis Zagano, this book's editor, is a member." 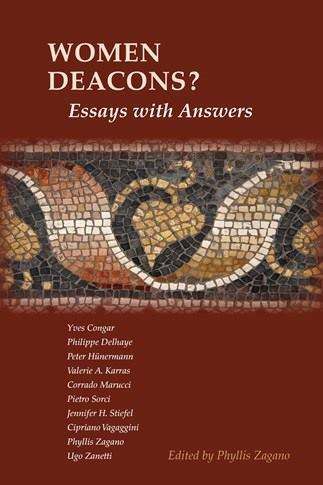 "Key documents in the newly re-ignited discussion on women deacons, these (mostly) translated essays provide scholarly substance. While consensus remains elusive, there is plenty of historical evidence to call Phoebe (Romans 16:1) a deacon and invite women to follow in her footsteps. Whether women becoming deacons is the best or even a feasible way forward remains to be discerned for which this book is a great help." "Zagano has now assembled an anthology that summarizes the state of current scholarship. Let's see what the Pope's committee comes up with. In the meantime, read this book and get up to date. You won't regret it." "I highly recommend this work. The Selected Annotated Bibliography is a useful tool to pursue further study on the issue."